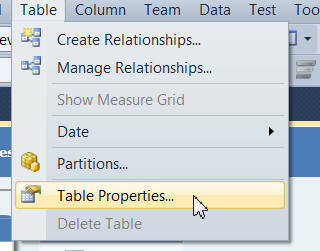 This page shows how you can add a table or a table column to your model. 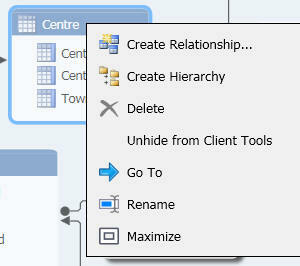 Deleting a table or model is easier: you just right-click on it and choose Delete. 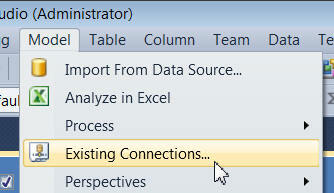 Choose this menu option to use an existing database. Click on this tool to choose to use an existing database connection. It's just as well we gave the connection a friendly name of MAM when we created it; you can now double-click on the connection to open it. Tick the table(s) you want to add, and give them friendly names as shown here. Here we've only chosen one table to add. 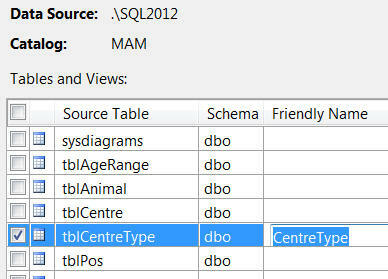 The problem now is that we need to add the CentreTypeId column to the Centre table! Memo to Microsoft: where is the Properties menu? Make sure you've selected the table you want to amend in some way, then choose this menu option. 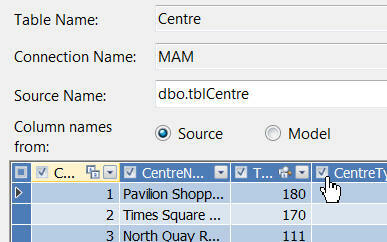 Here you should tick the CentreTypeId column to include this in the model. Linking each shopping centre to its type. 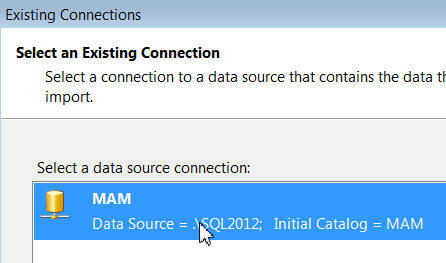 If you import two tables together, SSAS tabular will also import any relationship between then in the underlying database. If, however, you import the tables in two separate chunks (as we've done above), you'll have to create the relationship manually. Total quantity sold summed by centre type and species. And with that, I'll end this long blog on creating a data model in Analysis Services (tabular model)! Note that in the UK we also run classroom courses in SSAS.